Puss N Boots--Norah Jones, Catherine Popper, and Sasha Dobson--do Neil Young's "Down By the River" at Bell House. During my last year of law school I bought Everybody Knows This Is Nowhere by Neil Young and Crazy Horse. I knew of Young from Buffalo Springfield, a group I liked for their easy, country influenced rock. But when I put Everybody Knows on, I knew I had, if you'll forgive the obvious, a horse of a different color. The first two cuts, "Cinnamon Girl" and the title cut, could have been Springfield songs. They're lively, and the second, despite its despairing title (actually the lament of a homesick Canadian), has a sweet country lilt. But they both have an edge I hadn't heard on most Springfield songs. The third cut, "Round & Round (It Won't Be Long)" has a nursery rhyme cadence but the lyrics are truly despairing. The final cut on the first side, "Down By the River," was for me a mindblower. It starts with some nervous guitar chattering while Billy Talbot's bass provides an ominous counterpoint, then Young's keening voice sings what at first seem reassuring words--"Be on my side, I'll be on your side; there is no reason for you to hide"--in a precatory minor key, but after a few more lines this resolves into the chorus in a crashing major: "Down by the river, I shot my baby" (complete lyrics are here). After the first verse and chorus, there's a long bridge in which Young's and Danny Whitten's guitars exchange staccato notes, like a couple having an extended quarrel. The second verse has some words of existential angst that hint at a motive for the violent act: "This much madness is too much sorrow; it's impossible to make it today." After the second verse and chorus comes another long guitar break, a little more intricate than the first, then comes a repeat of the first verse and chorus, and fade out. Hear it here. Thanks again to Eliot Wagner I have the video at the top of this post, of Puss N Boots, a trio consisting of Norah Jones on guitar and lead vocal, Catherine Popper on bass and harmony vocals, and Sasha Dobson on drums and harmony vocals, doing "Down By the River" at The Bell House, my favorite Brooklyn rock venue. While I can't say this cover cuts the original, I found it thoroughly enjoyable. Having the solo guitar, Jones has to do double duty, which she does well by stretching some of the notes beyond the staccato, while Popper's bass fills in with some lively interplay. Jones's sultry voice imparts to the lyrics less of an angst-ridden and more of a world-weary quality. Like all recorded songs that end in fadeouts, there's the question of how to end it in live performance. Puss N Boots just ends it, which seems appropriate to me. Perfect ending to a perfect baseball opening day. 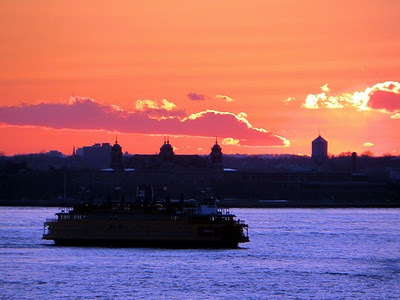 The Staten Island Ferry glides past Ellis Island as the sun sinks behind New Jersey's First Watchung Mountain; taken from the Brooklyn Heights Promenade. Mets trounce Padres in season opener: a bad omen? As I've noted before, my wife, a lifelong Red Sox fan, is convinced that a hot start is always a prelude to a bad season, and vice versa. As for winning the opener; well, the Mets won it last year--against the Braves, no less--as well as the next three games, and we know how that season turned out. Still, there was much to like about today's 11-2 victory over the Padres, especially, from my point of view, starting pitcher Jon Niese's (photo) performance at the plate as well as on the mound. Niese went to bat twice and got two hits, including one RBI, thereby leaving the game with a 1.000 batting average. This is baseball as it should be: pitchers should bat as well as pitch. Addendum: Red Sox beat Yanks 8-2, so it's a perfect baseball day for my household. Yes, my wife is happy. She'll get worried if the Sox go on an early winning streak. As far as wins or losses in the first game or early in the season, I will disagree with your wife. A win or loss early on will look exactly like every other win or loss on the last day of the season. I don't think that my wife would disagree with the observation that all wins and losses, whenever they occur in the season, count equally in the final reckoning. Her sense, as a long time Red Sox observer, is that if the team gets off to a roaring start, this typically presages a vertiginous collapse that makes late season losses outnumber early season wins. As a bonus, Eliot--God bless 'im--gives us a link to "Opening Day" by Dan Bern with Common Rotation.